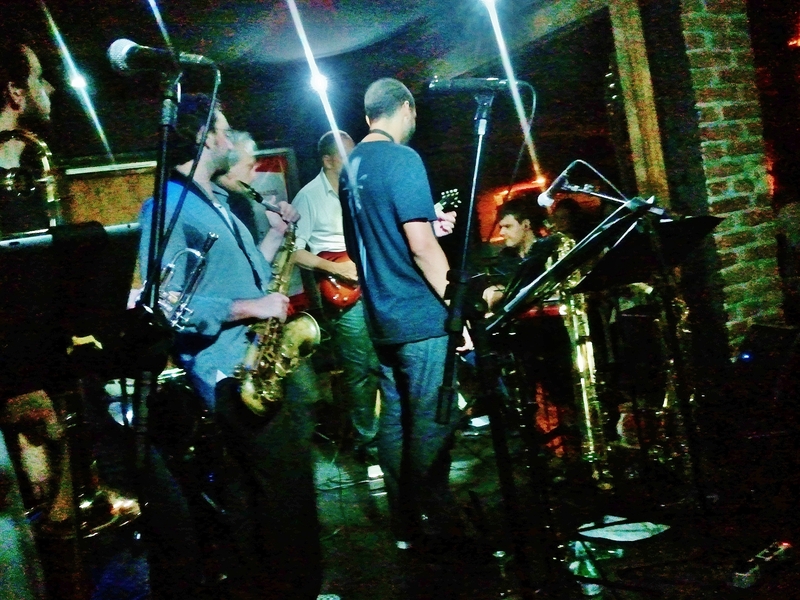 Went to see Sao Paulo Ska Jazz at popular venue Jazz nos Fundos (Jazz at the Back). It’s behind an unpromising-looking car park near a flyover which is home to a recycling depot used by Sao Paulo catadores, collecting metal, cardboard and wood on man-sized handcarts. The venue reflects its location in the decor – the look is industrial salvage with musical overtones. 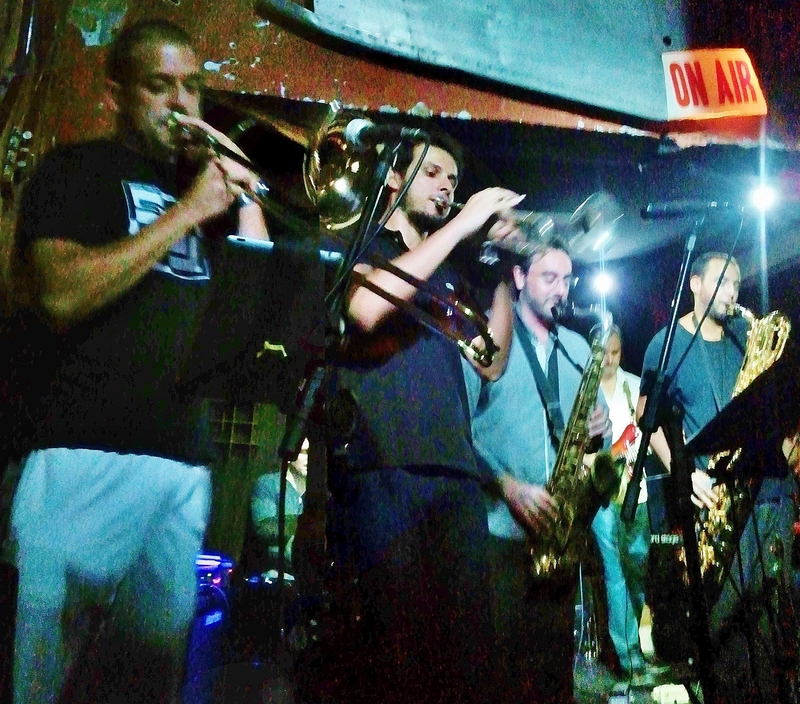 Sao Paulo Ska Jazz (SPSJ) revisits pop and Brazilian classics – Oasis, Tom Jobim – with a ska or a reggae rhythm and a hard-driving brass section supported by electric bass, drums, piano and electric lead guitar. The music may recycle other styles, but it’s definitely not rubbish. Though the sound can lack balance, the musicians are a tight-knit unit, with the quick understanding and appreciation of each other’s talents which comes from working hard together. 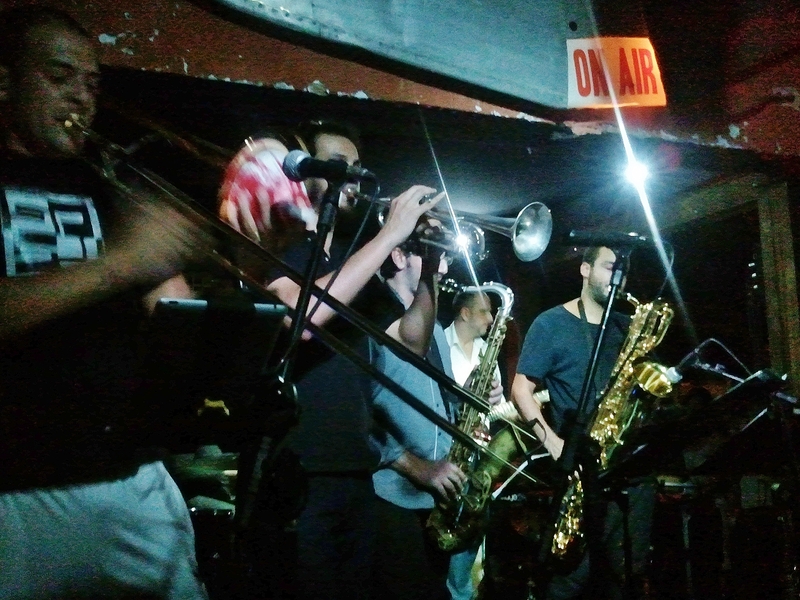 The eight-piece band is fronted by sax player Marcelo Pereira, who also plays with La Orkestra K. Playing the guitarra (electric lead guitar) at the core of the band is MD Aquiles Faneco, directing with an eagle eye and taking his solo spots with aplomb and sometimes abandon. 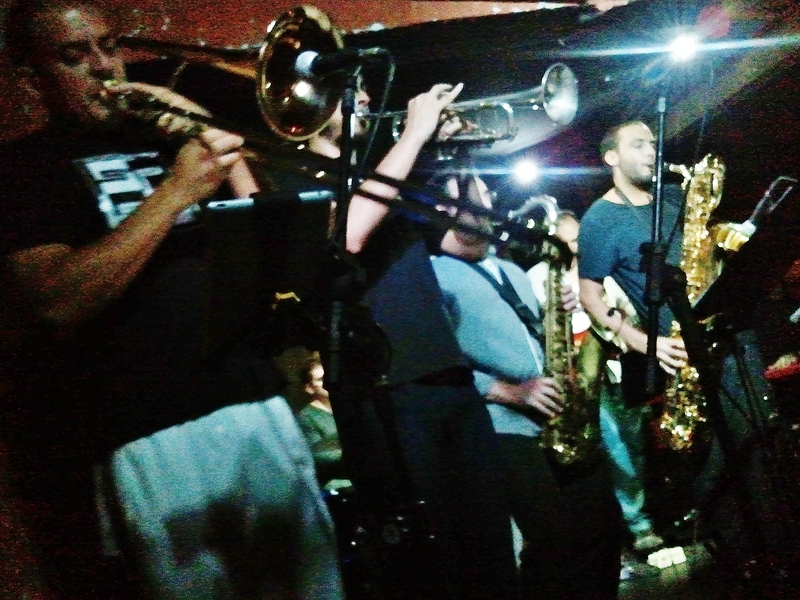 The players listen closely to each other, backing up solos, introducing or returning to the melody, as the focus shifts from one to another. The band has been together for close on five years. How refreshing that they can nevertheless still surprise one another with what they do! 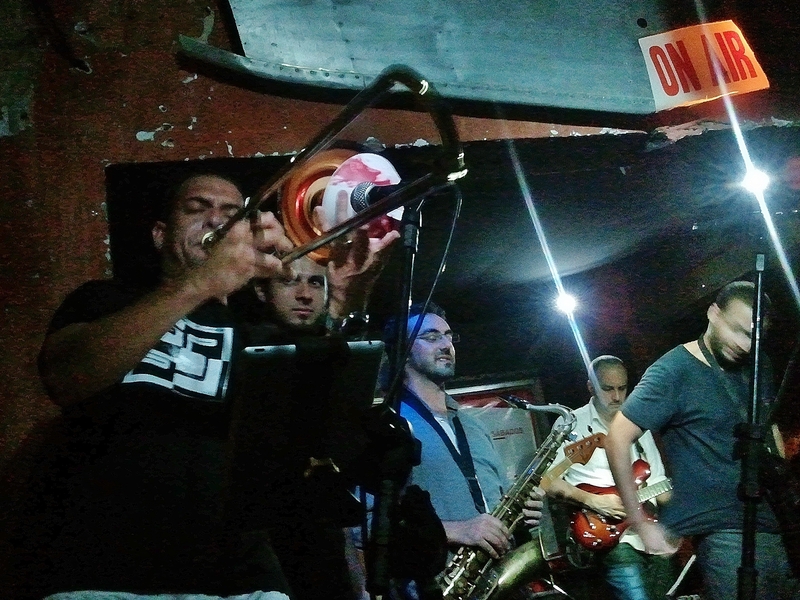 Look at the expression on the face of trumpet-player Diego Garbin as trombonist Douglas ‘Tigrinho’ takes his solo. The noise this band makes is a joy! 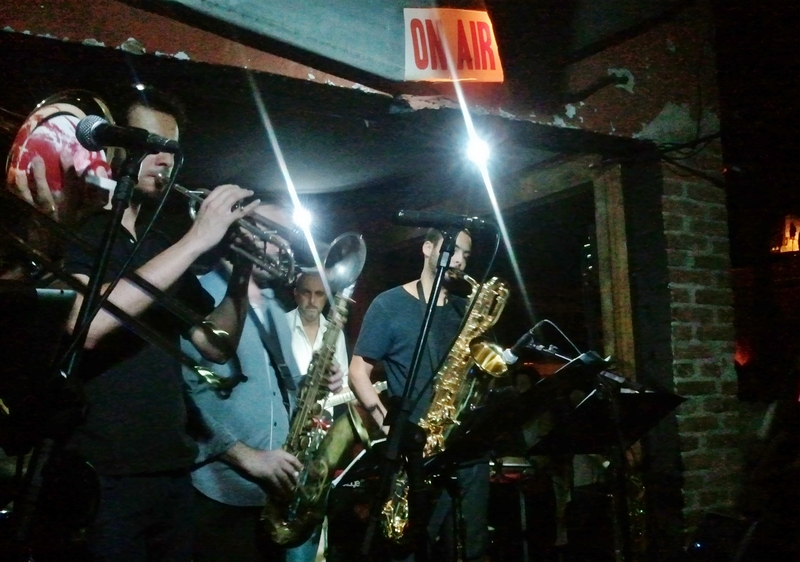 From the Jazz nos Fundos archives, here they are in full swing.